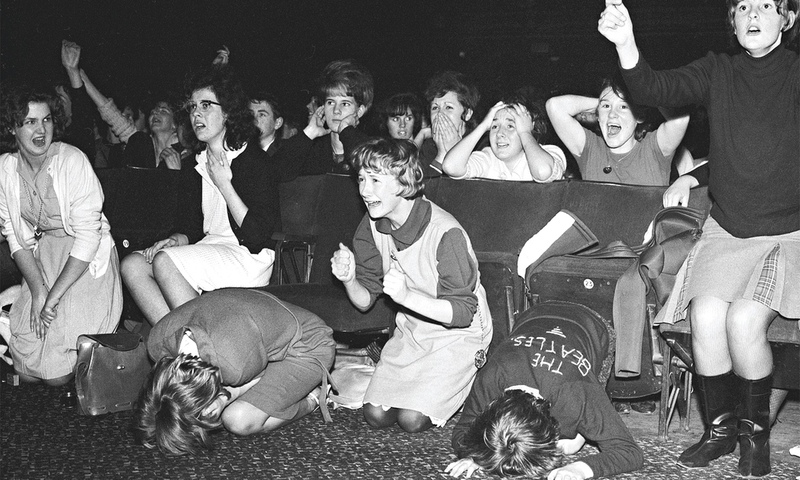 British Beatlemania: The front row of the ABC Cinema in Plymouth during the afternoon performance by the Beatles in 1963. Carol Cuffe is to the left of her younger sister with the Beatles jumper on. This story, courtesy of the UK Newspaper 'The Guardian', tells the story of Carol Cuffe, who had e-mailed the paper after seeing a photograph that was taken at the Plymouth gig she attended with her friend and younger sister. The Beatles were on their UK Autumn tour and played two performances (or 'Houses' as they were called back then). Carol, her sister Brenda and friend Janet seen the afternoon performance. "I was really into the whole Liverpool scene – Gerry and the Pacemakers, the Merseybeats – but the Beatles were something else. They were fantastic. So when I heard they were coming to Plymouth, my home town, I knew I had to see them. One Friday in October 1963, I caught a bus into town after school, made my way to the ABC cinema with my sleeping bag, and sat down on the pavement. At 4.15pm, I was first in the queue for tickets that were going on sale the following day. After a while, a couple of blokes arrived and were annoyed that I was there first. Later, my dad turned up with a flask of soup and some sandwiches. The next morning I got three front-row tickets – for me, my friend Janet and for my younger sister, Brenda. Before the concert, Brenda had hand-embroidered “The Beatles” on the back of her brown woolly jumper. I was wearing my best outfit – a denim pinafore with a black polo neck sweater. Everyone wore black polo necks then, like the Beatles. I was 16, and Brenda was 12." 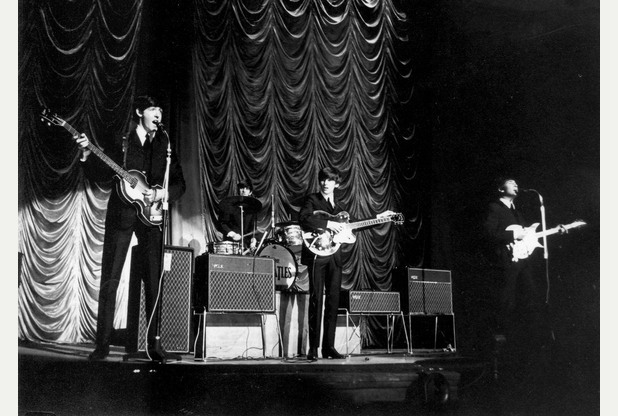 The Beatles, how Carol would have seen them, at the ABC in Plymouth 1963. "The concert, on Wednesday 13 November, was at the ABC. The cinema screen was rolled up, the 50s gold curtains pulled back, and the Beatles ran on. I screamed and screamed, as did everyone else. You were so thrilled to see these people, so familiar from TV and photographs, right in front of you that you took a deep breath, screamed and didn’t stop. It was a wall of noise. There were no amps back then, so the sound from their small speakers probably only reached row 12. I think I remember hearing them above the din." "Instead of going straight home, my sister and I hung around outside. We were hoping to catch a glimpse of them after the second performance. There must have been 1,000 people outside the cinema, and I had to keep a tight hold of Brenda’s hand. By the time we realised they’d left, we’d missed the last bus home. We had no money for a taxi so we started walking the eight miles back. After about an hour – it was now around 1am – I saw our father’s car coming towards us. He was livid, and worried. I think he was most upset that I’d kept my sister out so late. I was grounded for a month." Below is a video with interviews with people and fans who were there for this particular show. "The next day at school, Stoke Damerel High, my teachers weren’t impressed: this photograph was on page 5 of the Daily Mirror, with the headline: 'Hands, knees and – yeah, yeah, yeah!' I’d lost my voice, too. Most people’s parents got the Mirror, so they all knew I was at the concert. The Beatles returned to the ABC in Plymouth only once more, playing two concerts on the 29th October 1964. By which time they were known the world over.